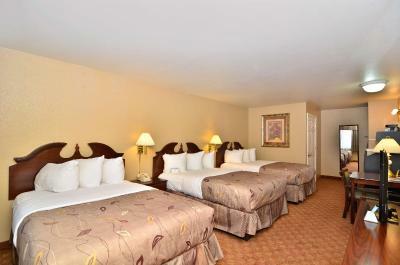 Lock in a great price for Best Western Fallon Inn & Suites – rated 8.8 by recent guests! Comfortable, clean beds. Friendly staff, easy to find, bonus break room open 24/7 to guest!! The location was in the center of town and close to the highway as we had to leave early the next morning. Convenient location. Clean. Friendly staff. Very nice breakfast for the price. Very friendly staff. Room was very spacious. Quick stay on our part, but was very accommodating. Service was good and the room has lots of counter space in the room. The breakfast was satisfactory. The room had everything needed...including a bath mat! Liked the larger towels and there were plenty of them! Beds were clean and comfortable. Very clean! Room was nice and quiet. The bed was comfortable also. Receptionist Megan was astonishing. friendly and respectful. She went beyond.expectation to be helpful. She never lost her smile with a tedious customer ahead of us and after an extended time, turned to us eager to assist. Very friendly and helpful staff. Furniture seemed new and the room was clean. Breakfast was good and wifi worked great. Best Western Fallon Inn & Suites This rating is a reflection of how the property compares to the industry standard when it comes to price, facilities and services available. It's based on a self-evaluation by the property. Use this rating to help choose your stay! Located off Highway 50, this Fallon, Nevada serves a daily continental breakfast and offers rooms with free Wi-Fi and a 42-inch flat-screen TV. Churchill Springs Casino is a 12-minute walk away. 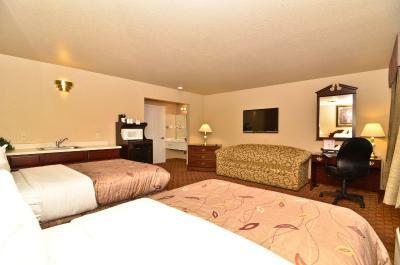 A microwave, fridge and coffee maker are provided in all rooms at the Best Western Fallon Inn & Suites. Each room is warmly decorated and includes a work desk. Free access to the on-site fitness room and seasonal outdoor pool is offered to all guests. The front desk is available 24/7. The Churchill County Museum is just 1.4 miles from the Fallon Best Western. The Fallon Golf Course is a 5-minute drive away. This property also has one of the top-rated locations in Fallon! Guests are happier about it compared to other properties in the area. 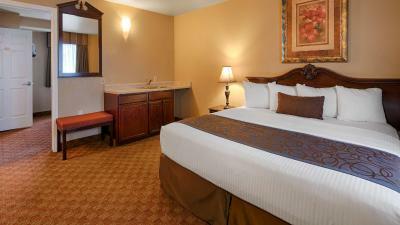 When would you like to stay at Best Western Fallon Inn & Suites? Pets accepted in this room with a daily fee. Up to two dogs per room with an 80 lb. weight limit per animal. Other pet types such as cats, birds, or other animals are allowed at the discretion of the property and require prior approval from the property. Please contact property for details. This quadruple room features a tea/coffee maker, microwave and cable TV. House Rules Best Western Fallon Inn & Suites takes special requests – add in the next step! Best Western Fallon Inn &amp; Suites accepts these cards and reserves the right to temporarily hold an amount prior to arrival. Best Western Fallon Inn & Suites accepts these cards and reserves the right to temporarily hold an amount prior to arrival. We will be under renovations starting November 1 through December 31, 2018. Missed cleaning the room one day. I was blind-sided by a ridiculous $30 pet fee when my reservation confirmation said “no additional fees will be required by the property”. Room got too warm, couldn't control thermostat. The cleanliness and bed was comfortable! Carpet need to be replaced. It was pretty dirty looking. The TV was terrible and the provider was worse. There is no elevator, so you have a pack all your luggage up the stairs. Parking lot finish was messy. Desk man friendly, efficient. Room clean. room was very comfortable we booked an accessible room which was well laid out & roomy. Everything as described and we were completely satisfied! !